Oh my! Yes, my friends, that was our hallway linen closet. And like spaces like this often do, it got put on hold while we spent our efforts moving in, getting organized, and making the rest of the house beautiful. This closet became our “stuff zone.” And not stuff as in things, items, possessions; but stuff as in “stuff it in anywhere it will fit and shut the door fast!” One day back in April, I couldn’t take it anymore. I stopped what I was working on, and emptied the closet on the spot. Oh how my husband loves it when I do this. Because suddenly, everything stuffed in that closet was now running up and down our previously neat and passable hallway. And since it wasn’t our “current project,” I had no supplies or plan for getting the closet put back together. 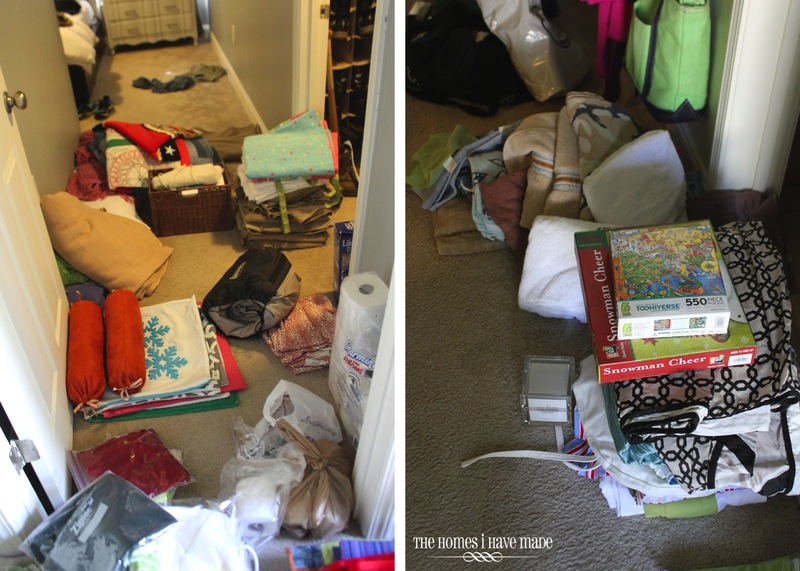 Even though I didn’t yet have a plan, I KNEW emptying the closet was the first step, whether my husband liked it or not. 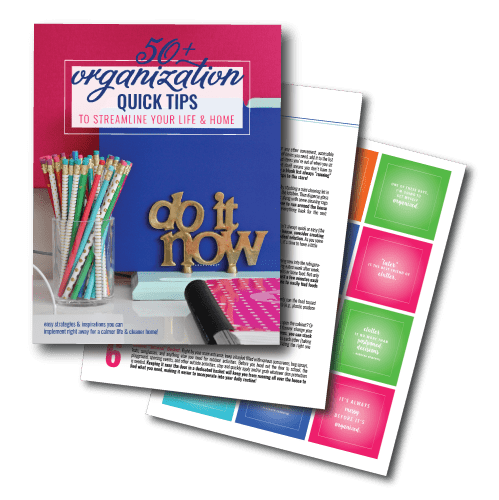 There is no point in going out and finding organizational supplies until you know what needs organizing!!!!! Well, after a day of purging and organizing and a single shopping trip to Target, our closet was put back together in a much more beautiful and functional fashion!!! Take a look at our Linen Closet now! 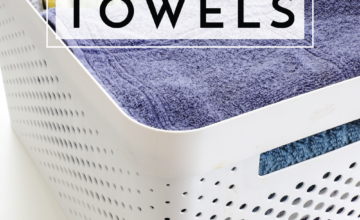 Get rid of things we really don’t need (i.e., old towels, ugly curtains I’ll never put up again). Make what’s in this closet SUPER EASY to get in and out. I don’t know about you, but if something is too hard to take out or put back – it never gets used! 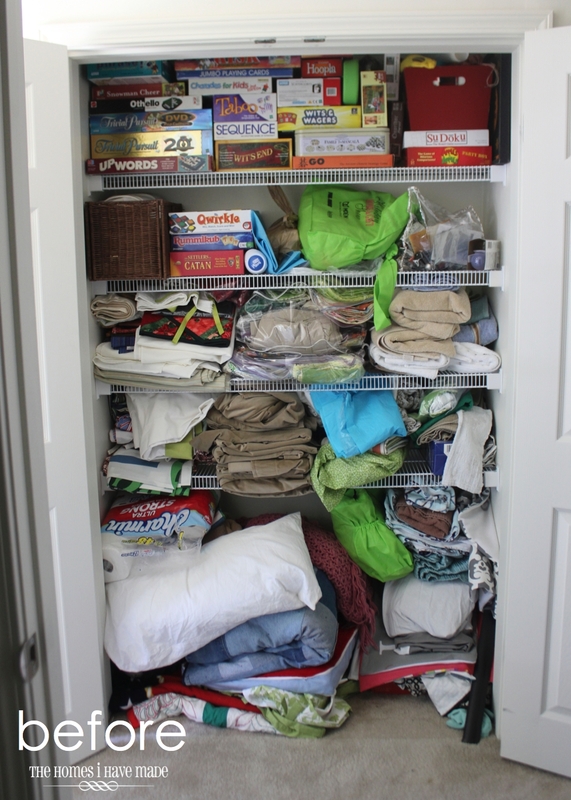 I have employed several different organizational systems to make this good-sized closet work really hard for our family. A few months after this makeover, it’s still tidy and organized, which means I succeeded in storing the right items the right way! I’m going to walk you through each shelf! Let’s start on the floor! Two of the main items that were stuffed in this closet and causing the biggest headache were blankets and pillows (as well as pillow covers). 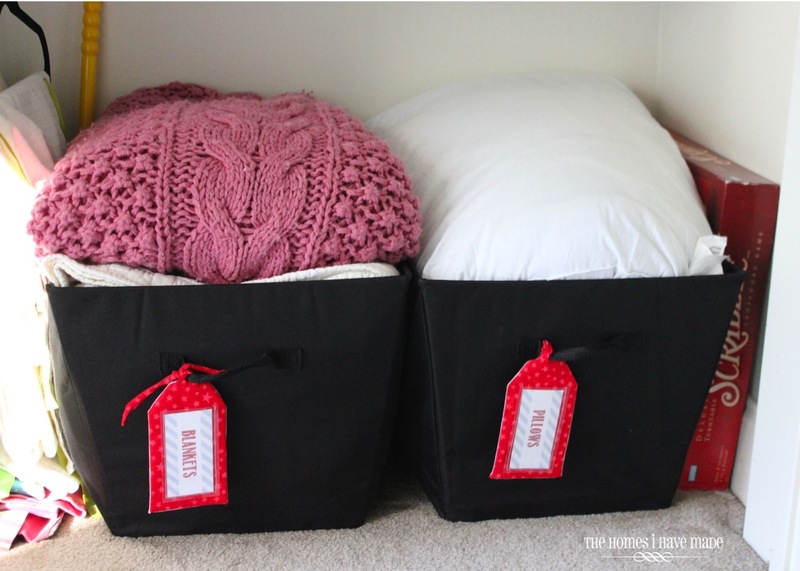 These things don’t exactly stack nice and tidy; and once you pull one blanket or pillow out, usually the rest follow onto the floor! I knew big baskets were my answer. I found these two HUGE black canvas totes in the laundry basket section of Target. The one of the left holds all of our blankets; while the one on the right holds extra pillows, throw pillows, and decorative pillow covers. Next to these baskets are my absolute favorite thing I have done in this closet makeover: our table cloth and table runner hangers! These are also items that do not stack well and were a big ol’ mess in the closet. 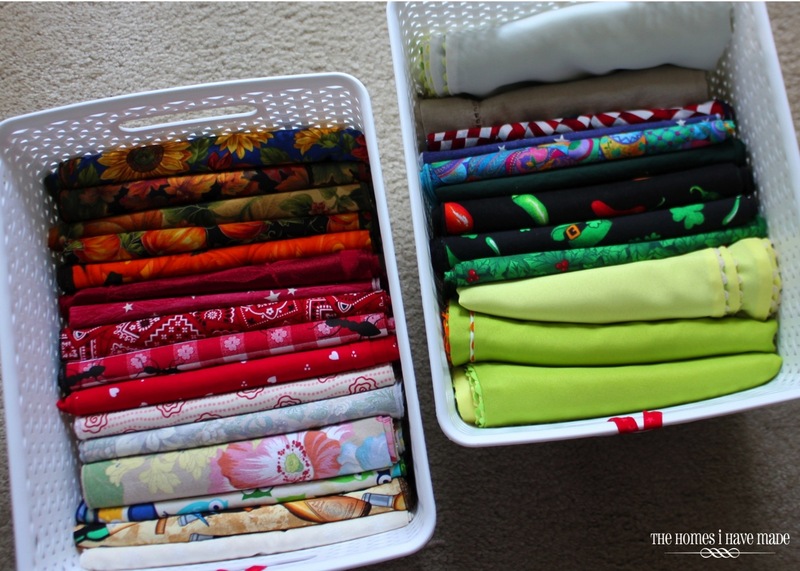 I wanted some sort of system that would allow me to access all of my runners and table cloths , as well as remove ONE without having to dig, un-fold, and make a mess of ALL the rest. 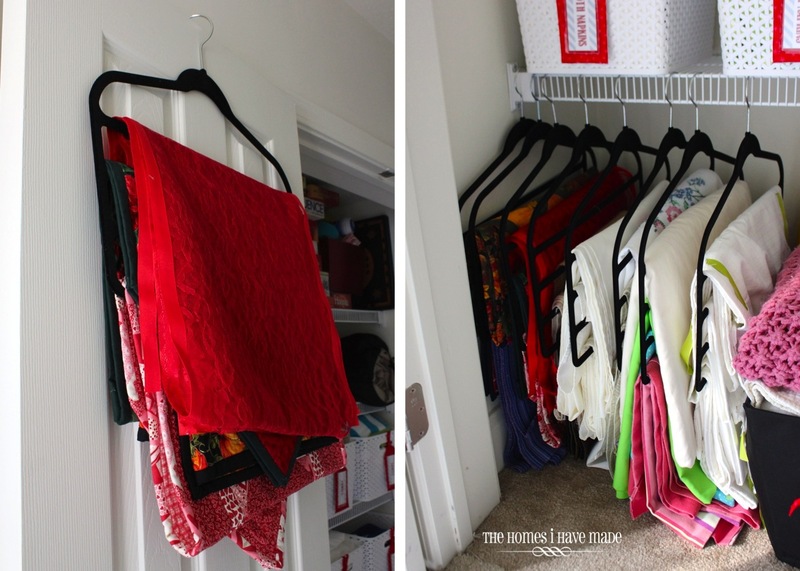 These four-tiered hangers, also from Target, were the absolute perfect solution (and the price wasn’t too shabby either!)! I have one table runner or table cloth on each bar. Now, I can see exactly what I have at a glance; and getting them off and on is quick, easy, and hassel-free! The middle two shelves hold eight large Y-weave baskets. 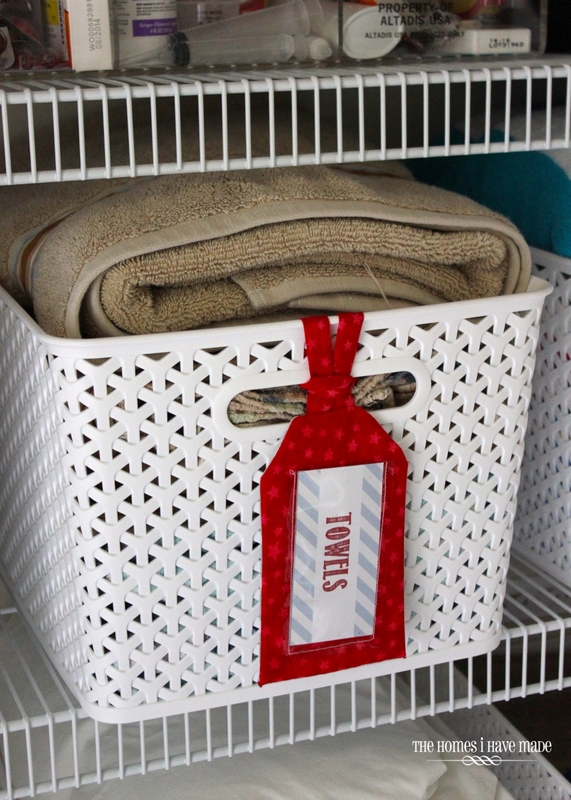 I loved these baskets so much for toys and craft supplies, that I knew they would be a good, neutral, long-lasting, and sturdy choice for the linen closet as well. (No, these are not the ones from the playroom or craft room…those are the no-longer-available XL size. I bought 8 of the large-sized white baskets to fill these shelves but sure wish the XL size was stil available!) Bins and baskets work really, really, really well for my family, so I knew they’d be worth the investment. 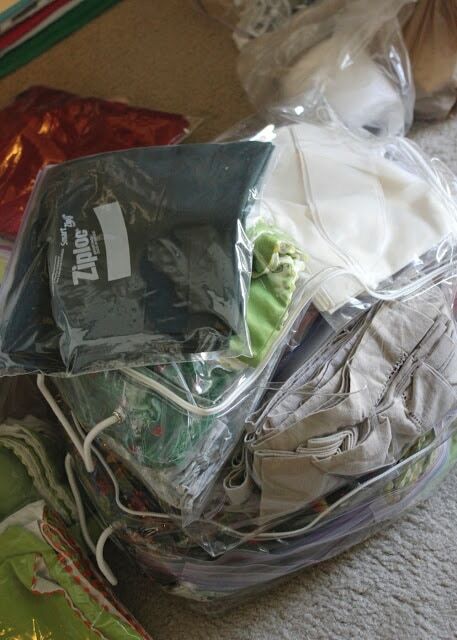 These baskets hold everything from sheets and towels, to first aid equipment and wash cloths! I also came up with another clever organizing solution (if I do say so myself 😉 for our abundant supply of cloth napkins. Here is how I used to store them: in plastic zip-locks, all in a large plastic tote with a broken zipper. 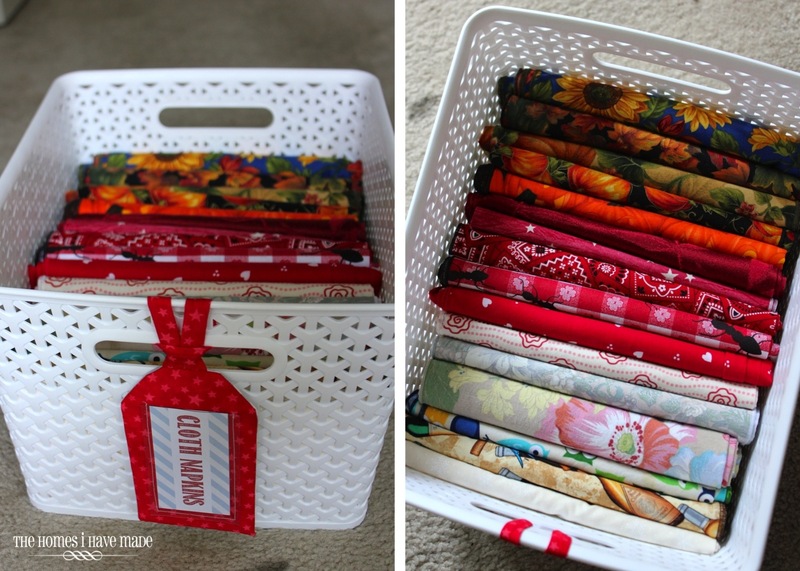 I bet you can guess how I often I dug out festive cloth napkins – ummm…never! After some playing around, I came up with a much better way to store my napkins! Now I can see all my choices, and they are easy to get in and out! Score! In the spirit of full disclosure, the reason you are just now seeing this closet transformation (instead of months ago when I did it), is that these baskets sat unlabeled for months–I like to show you projects once they are fully done…most of the time 😉 I just couldn’t come up with a solution I liked and wanted to spend the time and materials on. 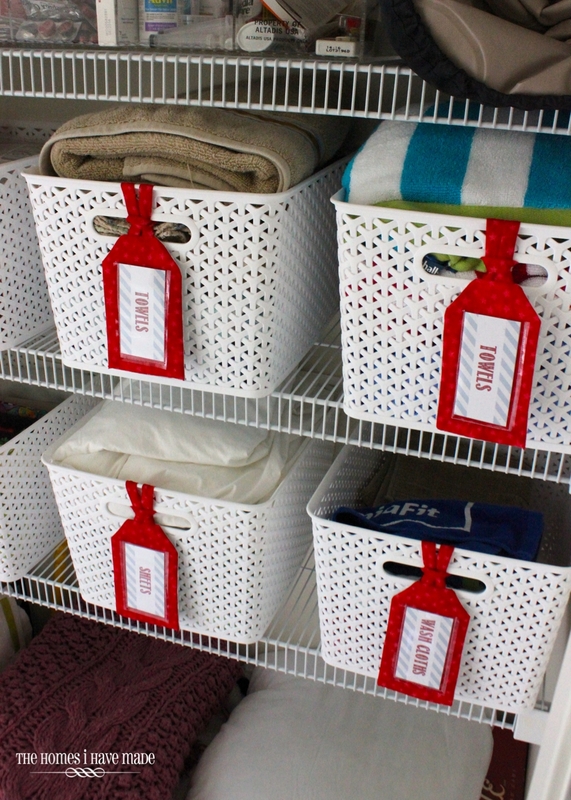 BUT…when I pulled off the playroom color switcheroo, my 10 red luggage tag labels were left without a home. 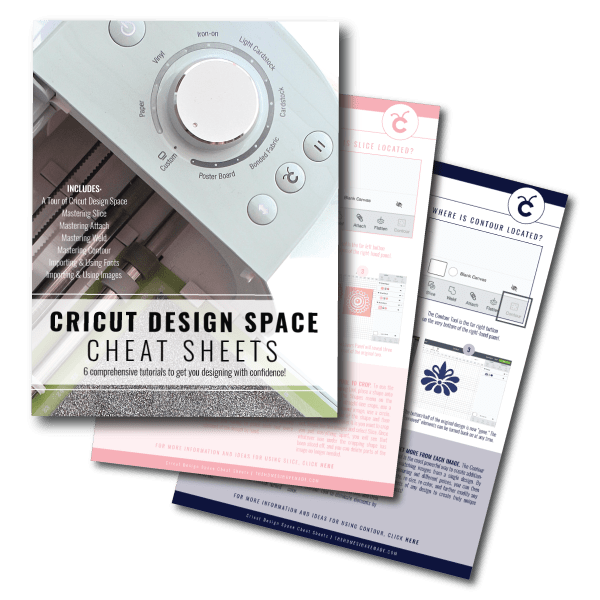 I was SO excited when I realized they were a perfect solution for the Linen Closet! After about an hour of creating new labels to go inside the luggage tags, these babies were tied on and back to work in no time! The pop of red was just what the closet needed as a finishing detail! 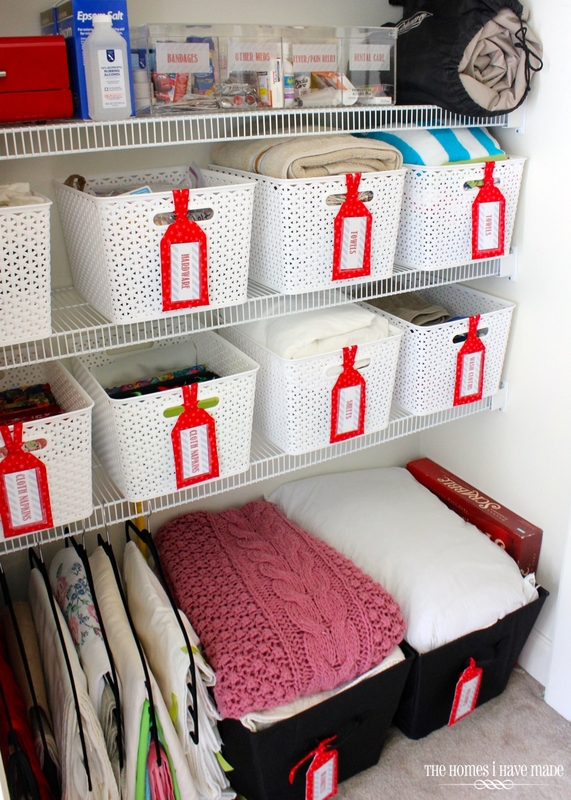 The last stop on our Linen Closet tour is the top two shelves. 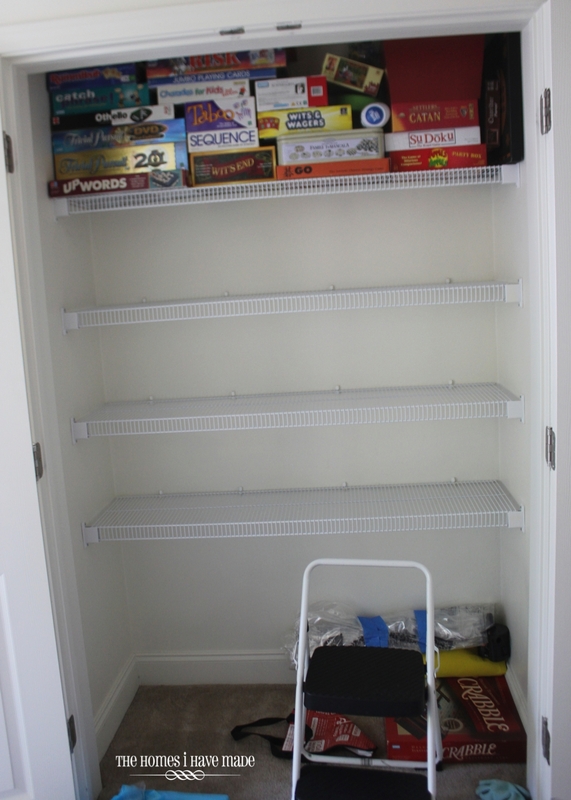 The very top shelf holds our very extensive game collection – sorted and organized as best as I could! My main goal was simply to get all the games on one shelf! On the next shelf down, sits this super awesome four-compartment acrylic box I got at a thrift store for $10. It actually sat around my house for 6 months while I tried to find a perfect spot for it. 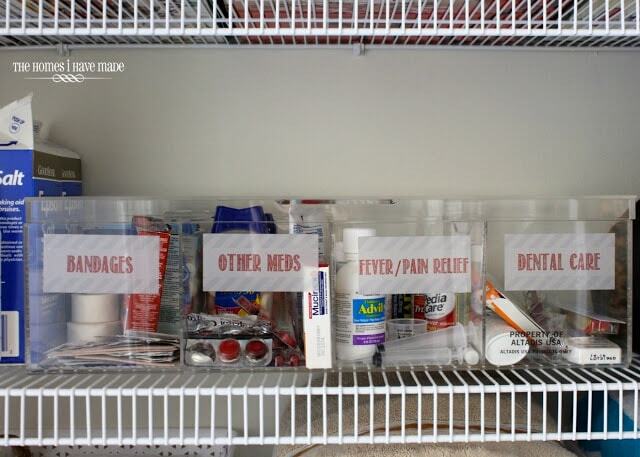 With the closet sorted out and re-organized, I finally had the space for it; and it perfectly holds all of our medicines and other small hygiene products! Oh – and the labels were printed onto clear adhesive paper and stuck right to the acrylic box! They are easily removable whenever I change the contents inside. A few other odds and ends made their way into the Linen Closet as well – the red tool box that used to hold cars in the playroom now sits empty waiting for something to go inside – I’m sure I’ll come up with something that needs a home eventually. Epsom salts and our air mattress are also tucked up for easy access. Here’s one more look at the before and after! All in all, this closet now makes everything we need and use quick and easy to find AND put away! 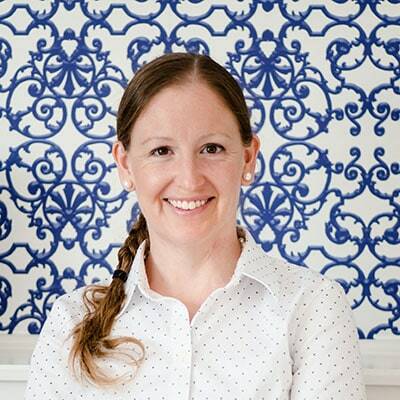 I sure do love a makeover that looks cute…but when it works really well to boot – that’s when I feel the time and cost were all worth it! 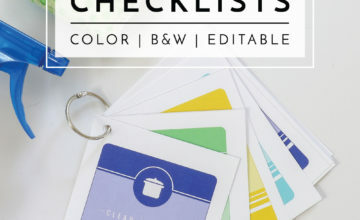 As I mentioned, I’ll have my Linen Closet labels available for you in a printable format on Thurday! Until then, have a great start to your week! Looks fantastic!! You did a fabuluous job!! Love the baskets with the red tags!! Perfect!! Thanks for sharing!! That looks fantastic!! I wish I had a nice big linen like that! Now I just have to start looking for awesome baskets. My linen closet looks like a hoarders nirvana. Looks Fabulous. These are such a ingenious ideas for organizing the baskets in a very beautiful way. It all looks very impressive.Thanks for making this post inspirational and full of creative ideas. Looks awesome!! Love the idea of hanging the tablecloths and runners – brilliant :). Stopping by from tatertots and jello. It's easier to focus when you don't see a lot of mess in your home. 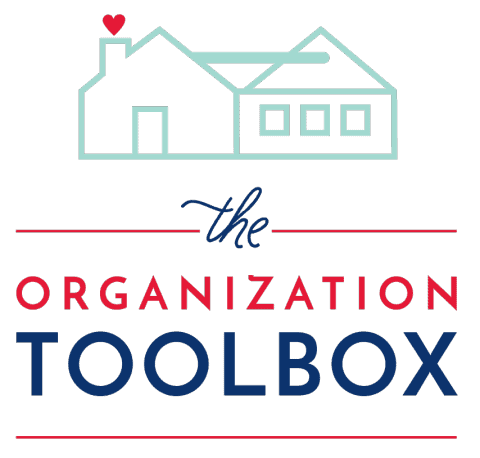 So, organizing does indeed help you concentrate with work better. I like what you've done with your home. It's very organized! When your son is older you should make a living doing decorative organizing. I'm sure there is a huge need for that type of service. I need to redo my linen closet again. Our blankets are all over the place and I need to see what we need. It seems like all our sheets and towels are falling apart. I used to work in Linens and always got good quality stuff. Now I'm just happy with items that have no holes and fit. Amazing! Love your idea with the hangers! I don't have a closet like yours but I would see what I can do with my linen cabinet and make use of the shelfs in the laundry room. Thanks for sharing! What a transformation! 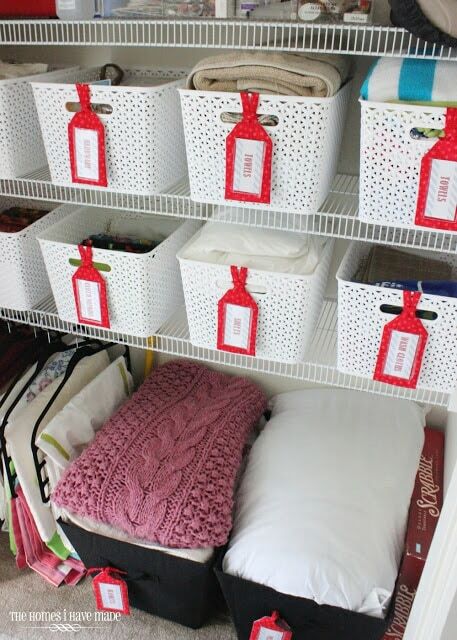 I like how you keep everything organized in the baskets. The use of luggage tags is just perfect. Thanks, this is really helpful. I love the idea of luggage tags to label the baskets – although I will be purchasing luggage tags so the project actually gets done. Also, I hang my tablecloths on hangers, but never thought to hang them on the shelves in the linen closet – mine will be moving from our coat closet to the linen closet. Thanks! 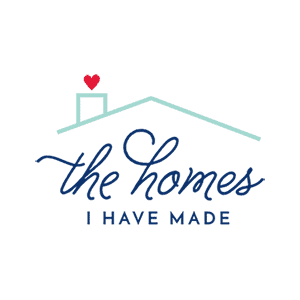 Just found your blog through the Iheartorganizing link up! 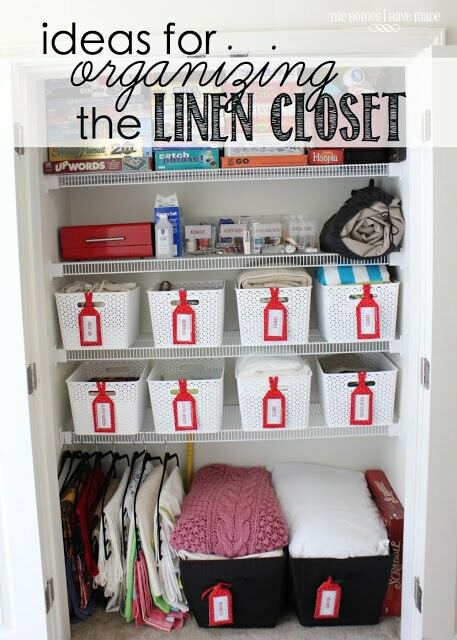 Love love love your linen closet!! 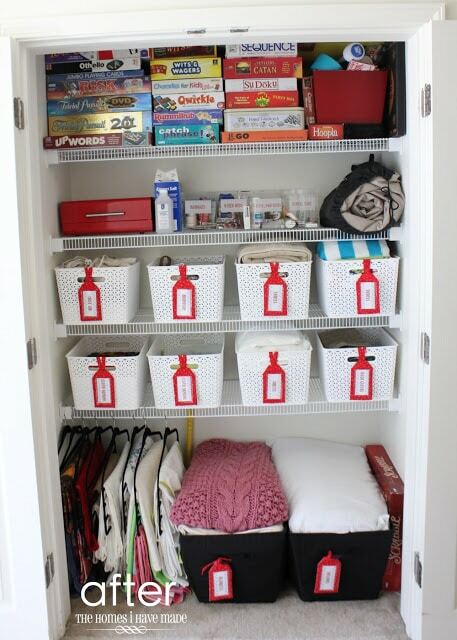 Great ideas and it looks so clean and organized! Will definitely use this as inspiration for mine! Megan, this is on my list of things to get accomplished too but it will have to wait a little while longer. I have those same type of shelves and hate them, so I am going to hire a handyman to put me different type in. 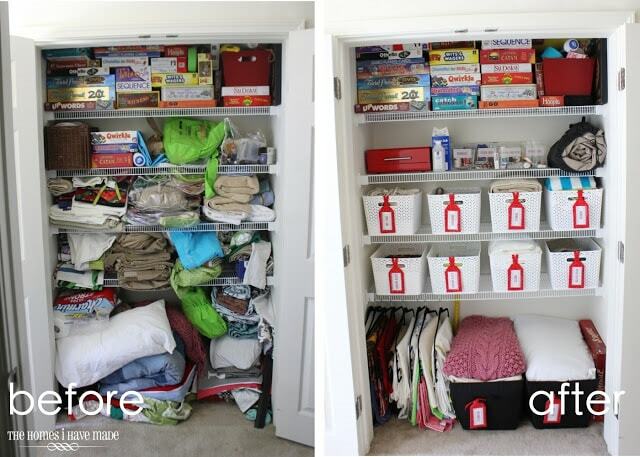 First I would like to buy an armoire that I can store blankets, quilts, extra pillows, sheets/etc. and then I'll have more room. If you want to get rid of any old towels or sheets, donate them to an animal shelter as they will be able to use them. 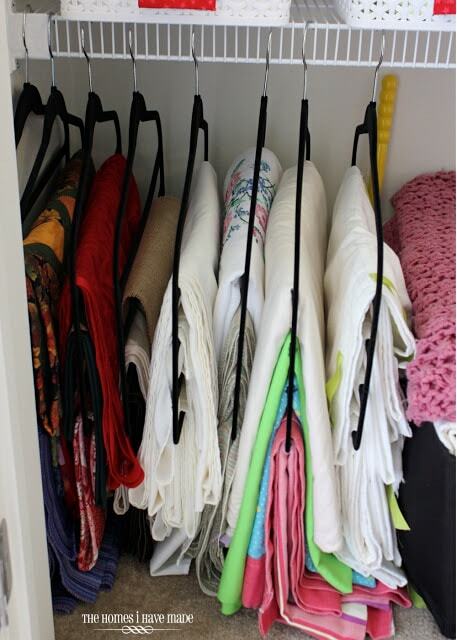 Somebody mentioned on their blog, she got rid of all her old towel sets and bought all new ones that matched and the news ones were all one color or she bought two colors so the linen closet looks more organized when seen by others. I've tried to fold the matching washcloth inside the folded towel and DH doresn't remember that the washcloth is inside and he goes rummaging through all the other odd washcloths to find a match that may not be there anymore. When the washcloths get frayed looking, I give them to my cleaning lady to use in cleaning the shower and tile down. If a towel has a hole or looks raggedy looking, I cut it up and give to her for that same purpose. They get rewashed after she is finished cleaning every other week..I found this pack of microfiber cloths that are a nice size and can't recall where I bought them and she said they are the best. For two senior citizens, what do you think is a good amount of bath towels,etc. to have? I wash almost every day anyhow so I'm thinking maybe 4 or 5 sets? ?catch them on sale though. Where did you get the nice white baskets? 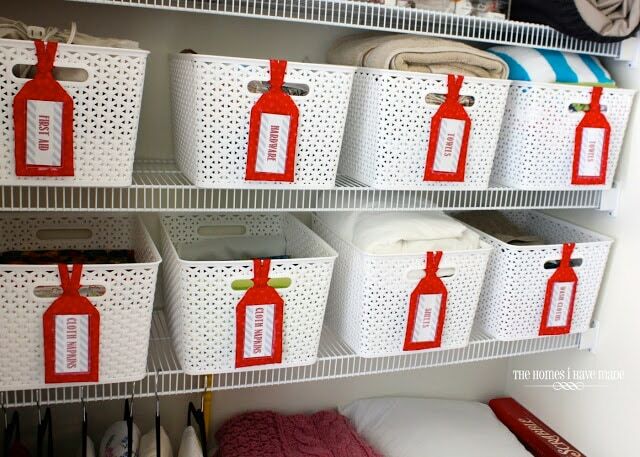 It is amazing how much a little organization will make you feel better about your home. An organized home is a clean and happy one. Great job. you showed us how to organized a home in practical way. I really appreciate your writing with full of tips. Great ! I really appreciate the ideas you shared, thank you so much. I will try this. These are great tips for keeping your capret green and clean! 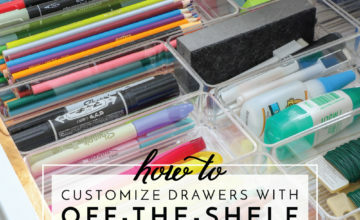 I have a cream color carpet so you basically see every mess, so I will have to try these tips! Thanks for sharing.